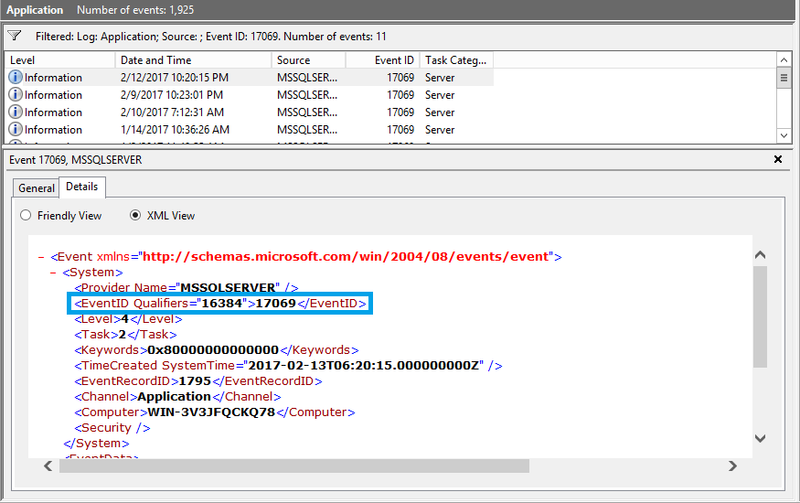 You might want to monitor the Windows Event Log by using a tool built in .Net which reads certain Event IDs where the Source is the SQL Server. I prepared a small test case which shows how Windows stores the Event ID and how you should (not) read them. I am using a Windows Server 2012 R2 and Microsoft .NET Framework 4 for my test. As you can see the InstanceID is completely different from the EventID. So even if the documentation of Microsoft says that EventID is obsolete and InstanceID should be used you will not be able to find your EventID when you are scanning for InstanceID. But let’s see why does InstanceID show a different result from EventID. Now when we combine these two numbers we get: 01000000000000000100001010101101 which is 1073758893. And this is the number which is displayed when we read InstanceID. The above examples showed the difference between EventID and InstanceID, namely that EventID reads only the last 16 bits (or 2 bytes) of the Windows Event Log Event ID but InstanceID contains the whole 32 bits (4 bytes) of data.